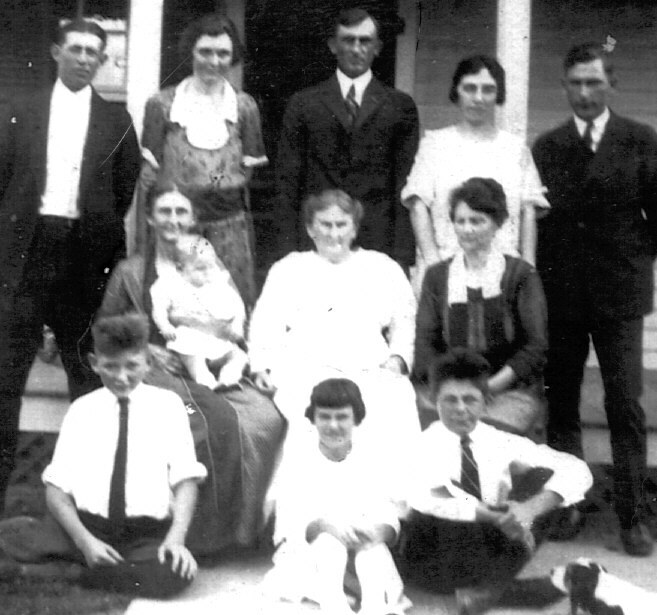 Julia Ann DOWNING "Miss Julia" Sturgis, of Marionville, VA, and her family. This photo, taken in approximately 1917, depicts Julia Ann DOWNING "Miss Julia" Sturgis, of Marionville, VA, and her family. Miss Julia had two daughters, Roberta May STURGIS "Miss Bertie" Goffigon (seated holding baby) and Sarah STURGIS, Meyers, seated on the other side of Miss Julia. Miss Bertie, who married Obediah George GOFFIGON, had three children: Oliver, Polly, and Rudolph Sturgis GOFFIGON. In the back row of this photo, you will see: Leon REED, Polly GOFFIGON Reed, (probably: Henry STURGIS, brother of Miss Julia), (probably Edith Goffigon, wife of Oliver), Oliver GOFFIGON. Seated: Rudolph GOFFIGON. The other two children possible of Sarah Meyers. Baby thought to be Leon REED Jr.